Symphonia domestica, Op. 53 (1902/3) [44'39]. Oboe Concerto (1945) [24'49]. Eine Alpensinfonie, Op. 64 (1911-15) [43'18]. Duett-Concertino for Clarinet, Bassoon and Strings (1947) [18'20]. Royal Liverpool Philharmonic Orchestra/Gerard Schwarz. It seems strange that the items on this twofer (actually most of them) listed as 'live' have recording dates that span several days and the only 'studio' recording was put down in one day. Whatever the case, this is a triumph for Schwarz and his Liverpudlians. I admit to a certain amount of trepidation on receiving this set, but the sheer quality of performance and recording has made me eat my words. The recording is actually quite close and as such is remarkably detailed. Most importantly, as one embarks on the domestic voyage, it becomes clear there is an echt-Straussian feel to it all, the strings warm, Schwarz's response to the score ever natural. 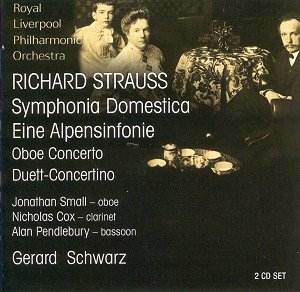 Orchestral soloists are excellent � try the agile, spiky oboe that begins the Scherzo, for example. The 'Wiegenlied' has a shadowy tenderness, yet these are not menacing shadows � more that the section is heard as if through a veil of finest lace. Schwarz paces the Adagio fourth section so that it moves but is still warm. Impressive in its passion, it moves to even more passionate territory � that of the finale. It is a tribute to the recording that even the most cacophonous climax makes sense, and there is no impression at any time of any loss of detail. The layout of this set is such that each disc contains a major orchestral work plus a concerto. The late oboe concerto is of course much loved - and much beloved of players of the ilk of Holliger, of course. In context, Jonathan Small's pastoral pipings are simply perfect and come in superb contrast after the stresses and strains of 'sweet' domesticity. Schwarz shapes the accompaniment with the utmost sensitivity and here and in the Andante before the high spirits of the finale, round off a thoroughly enjoyable account. The Alpine Symphony is a great orchestral showpiece and a virtuoso display of Strauss's pictorial abilities. The movement titles are given in English first in the booklet, by the way, then in German, then French. Taking on the likes of Karajan is a daunting task, but the Liverpudlians emerge intact. Indeed if some of the characterisation were to have been made just a notch more vivid, this might have approached a first recommendation. The arrival of Sunrise makes its point, but it is not absolutely together and not too revelatory � the Sunset is far more effective. Schwarz paces the work expertly, enabling climaxes to rise naturally. The off-stage horns are distanced further away than is the norm, but that is all to the good. This time the 'concerto' (actually the fun Duett-Concertino) emerges out of the Symphony. Late Strauss through and through, in this work Nicholas Cox's creamy clarinet seems just right. Dialogues, buffo in origin, between the soloists are a consistent delight. There is some magical bassoon playing from Alan Pendlebury in the all-too-brief slow movement before some very alive solo playing illuminates the finale.